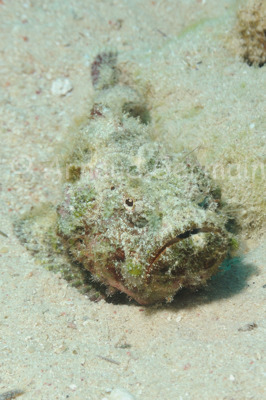 I had only seen one devil scorpionfish before encountering this one in Marsa Shagra bay. This particular fish was moving on the sand and coming towards me. I waited patiently until it was close enough for me to take a series of shots. Although well camouflaged, it is still not as good as a proper stone fish. Nikon D700, Nikon 28-105 mm macro at 105mm, F13, 1/60th, ISO 400, Ikelite Housing and Ikelite DS160 strobe set on TTL.